Ack! It's going to eat me! I love SCUBA diving. I love the feeling of weightlessness, the ability to move in three dimensions, the serenity of it, the aspect of exploration to almost every dive and the simple excitement I get just from being underwater. Advanced: Not so much advanced, as well-rounded. When I took it, I had five seperate focuses: deep diving, past 60 feet, night diving, underwater navigation, simple wreck diving, and 'multi-level diving', which is a more advanced, and involved method for planning dives. Nitrox:Nitrox is air with either some of the nitrogen removed, or with some oxygen added. The benifit is that when breathing it at depth, your body doesn't take on as much nitrogen (since there is less of it in the gas) and so you can stay down longer without getting 'bent'. There are, however, lots of down-sides... Such as reduced maximum depth and oxygen enduced siesures. Advanced Nitrox: This is the use of Nitrox with more than 40% oxygen, and with more complicated dive plans, including breathing gas switches. This is the gateway to decompression. 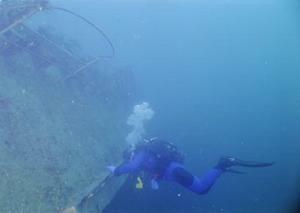 Solo Diving: This adds to the 'self sufficency' practices from the decompression class. 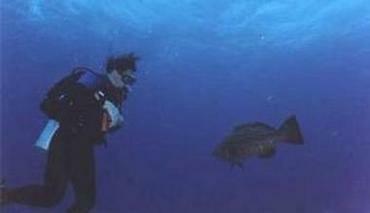 The idea is that at any time, wether you're diving with a buddy or not, you should be able to solve your own problems. Your buddy may not be around all the time, and the surface may be a long way away. beccy (2007-08-09): hey i do scuba diving as well! its awesome... though i only have my open water with PADI. though the weightessness underwater is great the weight above it however... not my favourite part.. just to make sure that i understand getting "bent" is nitrogen nicosis (sorry about the spelling)? My favourite type of dive if drift dives though, did it for the first time last month, boy did i fall in love..
Erik (2007-08-14): Hi Beccy. Nitrogen narcosis is when the nitrogen in your system makes you loopy due to the pressure. (Partial pressure of nitrogen) Getting "bent" is scientifically known as DCS, decompression sickness. It's due to the dissolved nitrogen in your blood bubbling out, and restricting blood flow. A nitrox course will give you a very good insight into both of these conditions.